Have you ever seen a liver German Shepherd? Yes, there are liver colored German shepherds out there as well. Chances are kind of low that you may have seen one, but they are out there. Liver colored German shepherds have a lot of things in common with blue colored German shepherds in that both of them are considered rare colors and both of them are also considered to be confirmation faults as far as the German Shepherd Dog breed standard goes. Another thing the blue and liver German Shepherd Dog have in common are the fact that both of these colors are the result of a recessive gene. This "liver factor" or "blue factor" gene has to be carried by both parents in order to produce either a liver or a blue colored German shepherd. Below you can see a few blue and liver GSDs in the slideshow that I have prepared from a few of our readers pictures. Hopefully this will help you understand the blue and liver GSD just a little better. These blue and liver colors are also referred to as dilutes. And basically what this means is that the black color on the dog has been diluted to look more like a brown color in the case of the liver German Shepherds or it's been diluted to look more like a blue color or grey color in the instance of a blue German Shepherd Dog or puppy. So for the liver colored German Shepherd dog all the areas that would normally be black in color will now be some shade of brown - which can vary anywhere from a light to medium color of brown, to a deeper brownish color and sometimes even looking almost reddish in color. This includes skin as well as fur color. 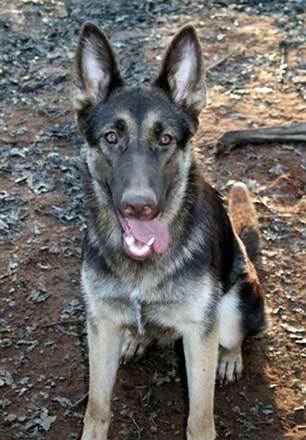 So should you avoid a liver German Shepherd if you were given the chance to get one as a pet? No. In fact this color has nothing to do with their ability to be a pet - and also these dogs have no health problems that are associated simply with the liver color. So if you were given the chance to own a liver or a blue colored German shepherd puppy or dog, if I were you I would have no problems in choosing it as a new pet for you simply based on color. After all, color has nothing to do with the dog's ability to be a pet or a companion, which in no way hampers the dog's ability to be an incredibly intelligent animal, pet and friend.